Tania McCartney Blog: We're off on our road trip! We're off on our road trip! Well, the bags are stacked by the door. We have bottles of water, books, colouring pencils, magazines and more snacks than a snacking convention's snack shack. The only thing left to do is fill the tank in the morning - and we're off on our It's A Sweet Life Family Road Trip to Sydney. We'll go via Goulburn (plan to stop at the Berrima lolly shop, for sure) and then the loose plan is arrival in the city centre by 1pm-ish, check in to our hotel, then hotfoot it to Darling Harbour to visit the Sydney Aquarium. Then it will be back to the hotel for a swim and a stroll to Wagamama (I remember feasting ravenously and frequently on great hulking bowls of noodles at Wagamama in London in the early 90s - I wonder if this Sydney joint will live up to my expectations??). 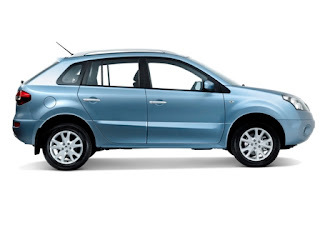 Of course, along the way we'll be sitting contentedly behind the wheel of our baby blue Koleos, spunky little mover that she is. And I'll be putting her through the suss-test. Sure, this car may have continuously variable transmission (so cool! but more on this later) but I must admit, I'm still totally hooked on seeing the kids colour-in on their flip-up tray tables. Wish I had one in the front, too. Stay tuned and I'll link you to my posts on Australian Women Online - complete with car reports and detailed travel tales to make your next trip to Sydney super kid-friendly. Tally ho! See you Wednesday. Very pleased to have discovered your blog Tania. Have noted Wagamama. You should check out Jasmine 2 if you like Middle Eastern food - it's a must stop for us when we transit Sydney to Gosford. Takes me back to a time when I lived in Damascus and it's SO kid friendly. I will follow your blog closely as travel with kids is my theme ... but am new at it (blogging) and keen to learn from the experts! Cheers. That DOES sound like "excitement"